eClimb is a company that has been around for a few decades, but has not penetrated the US market as much as other European manufacturers. I remember seein their radical looking tools online and in Haffner a decade ago, and always wondered how well they climbed. As online retailing has matured, getting your hands on a pair of these tools while paying in US dollars has become easy. First off, eClimb has an entire lineup of tools, built with similar technology, that span the range from lightweight alpine axes to full on steep technical tools. 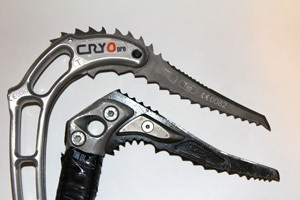 The Cryo Pro falls into the latter category and is most at home on overhanging drytooling routes and steep, featured ice. When picking up these tools, I am struck by the attention to detail on the handle’s ergonomics (particularly the lower grip). Each finger is given a slight impression, while the index finger groove actually indents deeper than the rest. This really locks your hand into the handle and is a much better implementation of what other manufacturers are trying to achieve with so called “trigger finger” grips. 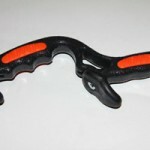 The rubberized pinky rest on both handles is reasonably comfortable and allows for any size of glove to be used without adjustment. The only detractor to the handle is that its texture is a thin, grippy coating on top of the aluminum. On really cold days this lead to chilly hands as I could feel the temperature difference between these and the more traditional rubber coated handles. The Cryo Pro is constructed out of a single piece of milled aluminum, instead of the more common aluminum-tube style. A distinctive look is not the only reason behind this design choice–the i-beam shaft design makes this an extremely rigid tool, especially given the clearance of the shaft. I found this rigidity to be a nice feature when drytooling on overhanging rock or when stein pulling as the lack of flex makes the placement more predictable and “quiet”. The tool has excellent clearance, but in a geometry that is different from the Nomic or Ergo. While the Cryo’s shaft doesn’t provide as deep of a bend, the gap between the tip of the pick and the upper shaft is about 25% wider than the Nomic. This is a great feature for hooking large ice features like cauliflowers or ledges. The shaft is also a good deal longer than other tools, allowing shorter climbers a little more of that critical reach (I often feel that one of the major grade-affecting variables in M-climbing is reach). The Cryo’s stock head setup says just one thing: lets go mixed climbing! There are hooking and stein pulling teeth galore. The top has a removable “crest” and their “Com” T-type pick has a super aggressive serration of teeth on the top of the tool (the “Pro” B-type ice pick is smooth up top, as it should be). 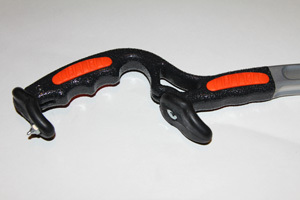 The “Com” pick has a nice deep hooking front tooth and is made of very durable steel. The finish of these picks is superb and they climb great right out of the box. 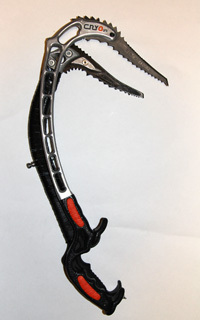 However, if I were to do much ice climbing with these I would remove the crest and use the Pro pick as all those top teeth are a nightmare when trying to remove a deeply set placement. Weighing in at 650g with the standard options, the Cryo Pro is just a touch lighter than the Petzl Nomic, and 30g lighter than the Black Diamond Fusion. The Cryo has a lighter feeling swing than the Nomic or Fusion as is its weight is distributed more evenly throughout the shaft. 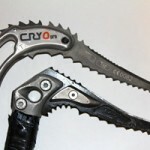 Thankfully, eClimb spent the time to make the Cryo’s swing a snappy one that rotates about the pinky. Overall I felt like the head weight fits a good middle ground between lightness for drytooling and enough heft for most ice climbing conditions. For very cold or brittle ice I would want to attach the hammer for a little extra heft in the swing. 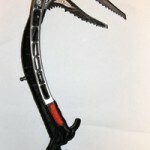 Overall the Cryo Pro is a polished and adaptive tool that performs well on steep rock and featured, difficult ice. Manufacturer details are here. 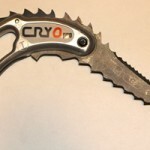 While you there, check out eClimb’s clever ice accessories like their aluminum ice screws with steel tips (save weight for alpine climbing) and stitchless screamers that are field reloadable. Editor Note: We want to say a huge thanks to Xarles at e-Climb. We got these tools a bit late last year winter and he has been very patient with us for getting this review done.